Almost 1,100 years after the birth of the poet for whom it is named, Baghdad's historic Al Mutanabbi Street was reduced to rubble by a car bomb that killed more than 30 people. Other casualties of that 2007 bombing included several businesses and their wares, a loss that surely would have immensely grieved the poet, whose full name is Abu at-Tayyib Ahmad ibn al-Husayn al-Mutanabbi al-Kindi. For centuries, Al Mutanabbi Street has been the center of Baghdad's intellectual community, renowned for its many bookshops, itinerant book vendors and convivial cafés and tea shops. The car bombing seven years ago not only claimed lives but shredded the very stuff that made Baghdad one of the world's most cosmopolitan cultural capitals. 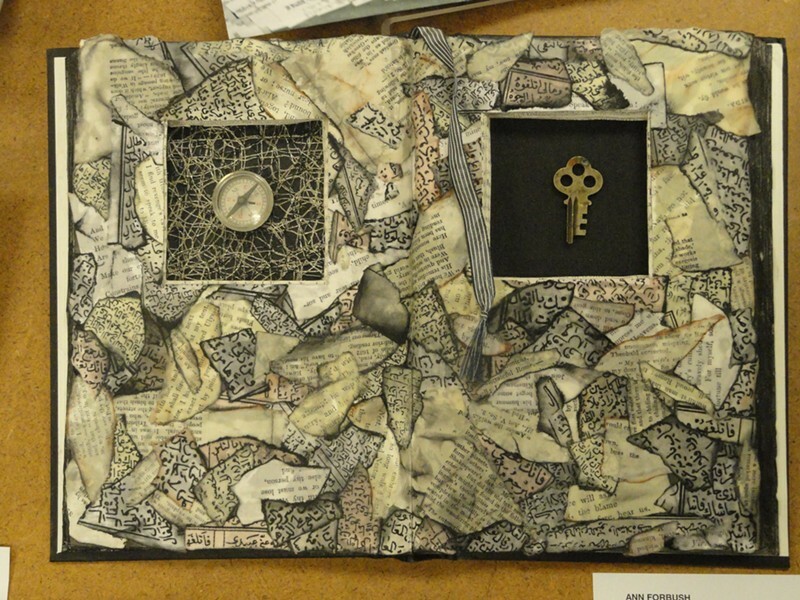 Starting on July 22, Plainfield's Goddard College will host a traveling art exhibit that uses books and printmaking to commemorate the loss of one of the world's great literary communities. 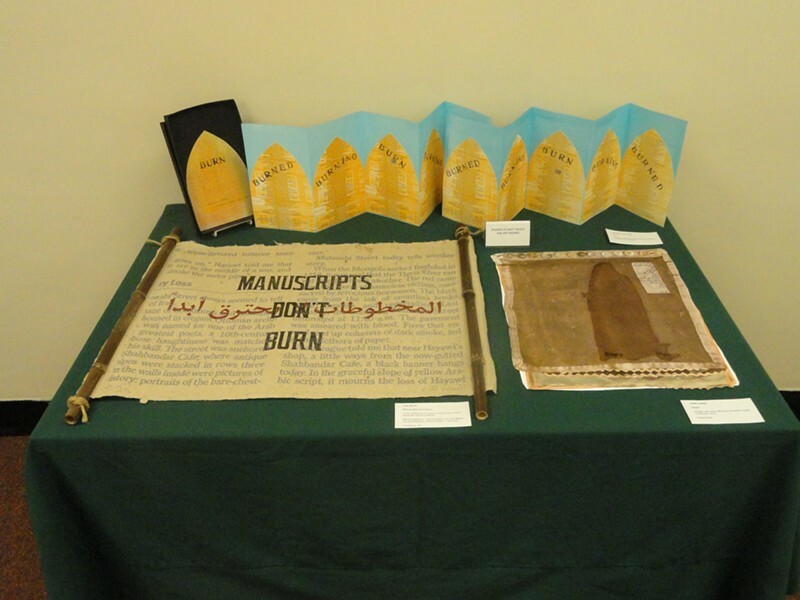 The exhibit, "Al Mutanabbi Street Starts Here," has been traveling the world since 2012, and will remain at Goddard's Eliot D. Pratt Library Art Gallery until October 10. Its creator, San Francisco poet and bookseller Beau Beausoleil [PDF link], will discuss his work at an opening-night event. "Al Mutanabbi Street Starts Here" brings together works and writings by artists from 26 countries, all of whom have created works of books and paper, often charred and mutilated. Many of the artworks on exhibit are hand-printed, politically minded, letterpress broadsides; others are one-of-a-kind artist-created hardback volumes. All of the works lament the cultural history and intellectual exchange that were damaged or lost when Al Mutanabbi Street was largely obliterated. Ever since a Goddard faculty member saw the exhibit and spoke highly of it to her, Clara Bruns, Goddard's director of information access, has been working on bringing it to the school. In an email, Bruns calls the exhibit "an expression of solidarity. [These] artists want to communicate that intellectual voice and artistic activity can’t be destroyed through violence." She continues, "[The] project is more than a voice against violence. When we really face and think about the motives and implications of this attack, it becomes an attack on all of us who value freedom of artistic and intellectual expression." For this reason, a college library seems an especially apt venue for this international exhibit. 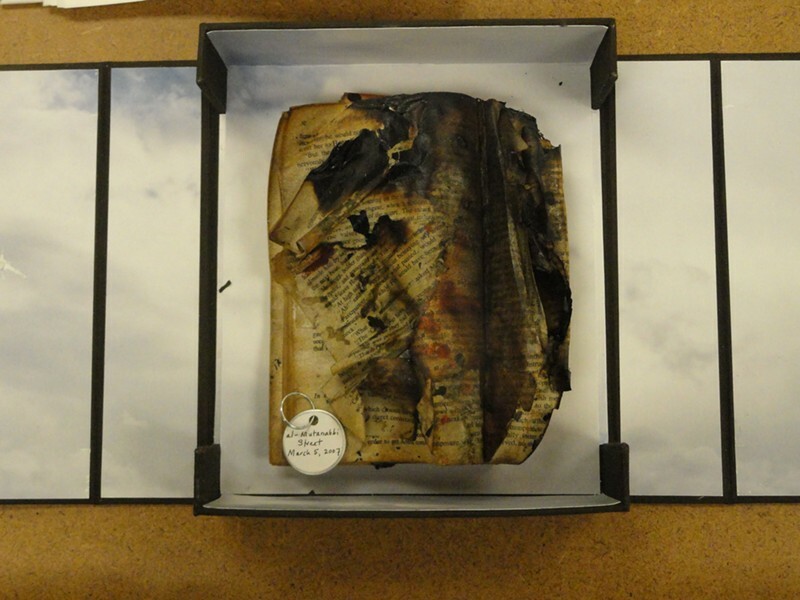 "Al Mutanabbi Street Starts Here" is on exhibit at the Eliot D. Pratt Library Art Gallery, Goddard College, in Plainfield through October 10. Free.